Drive: Multiplier Mayhem online slot game is a five-reel, 15-payline slot developed by NetEnt. 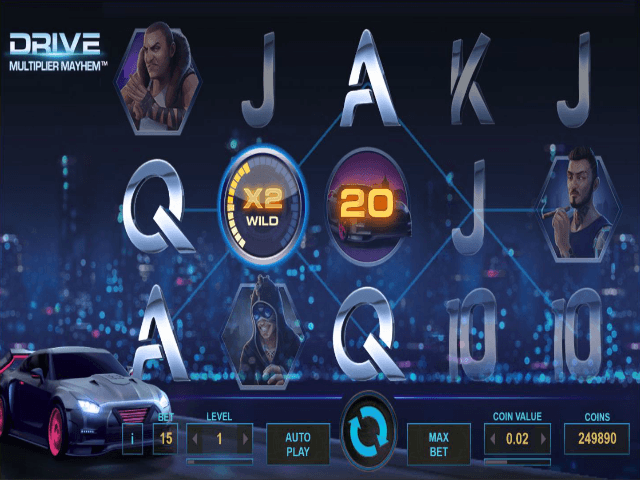 This high-octane slot game roars into life with a street racing theme that Vin Diesel would be proud of. 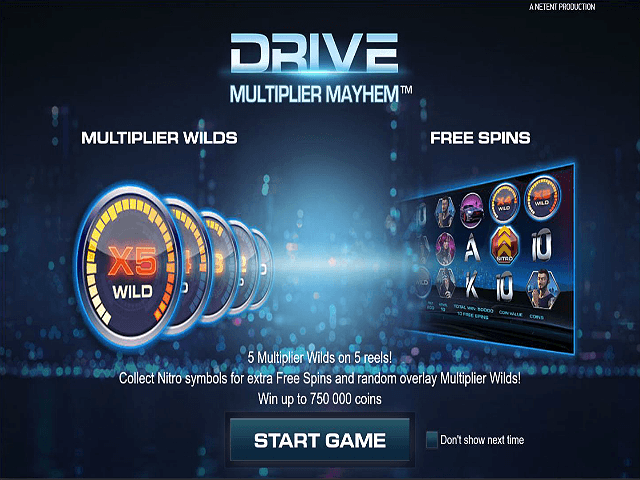 Read through our Drive: Multiplier Mayhem review to see if you should slip behind the wheel of this exciting slot game. Play Drive: Multiplier Mayhem for Real Money! Drive: Multiplier Mayhem is inspired by the shamelessly successful Fast and the Furious film franchise, as well as EA’s Need for Speed video game series. Each spin of the reels sounds like the gears being shifted up a notch, while the soundtrack is more euphoric, ideal for long, adrenaline-fuelled drives through this game. Casino software provider NetEnt has designed a beautiful backdrop for the game’s transparent reels – a sprawling city at night, with neon lights twinkling in the distance. A stylish racing car with bright pink trims is constantly driving through the night as players spin the reels. Even if you’re not a racing fan, the nitrous-burning return-to-player (RTP) rate of 96.7% should tempt you to at least take it for a spin. 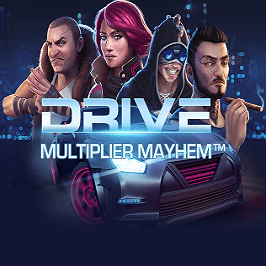 As the title suggests, Drive: Multiplier Mayhem is all about the multiplier bonuses. The Multiplier Wild symbols take the shape of a car speedometer. They can appear on any of the five reels, and replace all symbols with the exception of two – the Scatter and Nitro symbols. In a tantalising twist, the value of the Multiplier Wilds is linked to the reel they fall on, so they’re worth x5 if they park up on reel five. The game certainly lives up to its name – if more than one Multiplier Wild appears, then these multipliers are multiplied again. For example, Multipliers on reels two and four would give you a grand total multiplier of x8. There’s also a Free Spins bonus that’s activated when three or more of the Scatter symbols appear on reels two, three, and four. They don’t need to be part of a payline, and grant racers up to 10 Free Spins. 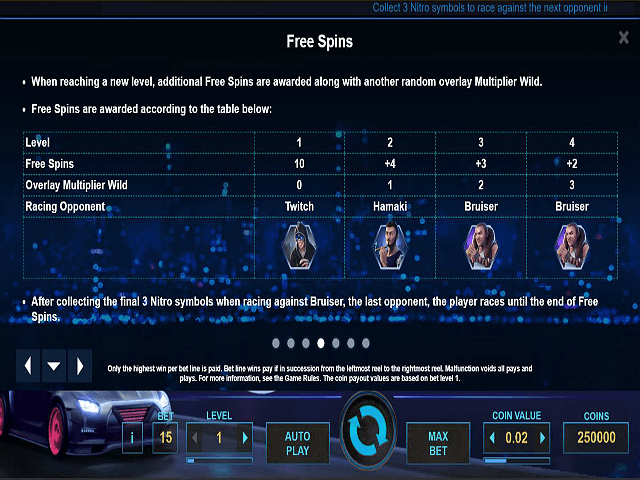 It’s during the free spins round that the Nitro symbol comes into effect. Like the Scatters, they only fall on the central three reels, and shoot out more free spins and overlay Multiplier Wild symbols. These randomly appear and act as Multiplier Wilds, but only one Overlay Multiplier can appear on any given reel. The Nitro symbols also fuel the Nitro gauge at the bottom of the board. Once it’s full, the game shifts up a gear to the next level where you face off against a new, tougher racing opponent. The fellow racers include Twitch, Hamaki, and the Dominic Toretto-inspired Bruiser. These racers also appear as separate icons on the board, along with the racing car and a pink-haired female racer. She’s the highest paying icon, and landing five matching symbols on the same payline is worth 150 times your initial wager. 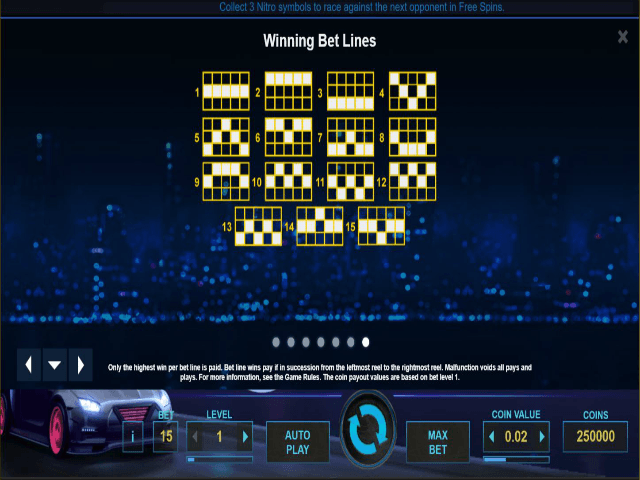 Drive: Multiplier Mayhem also has classic slot symbols such as 10, J, Q, K, and A, filling out the reels in chrome-plated style. Share this Drive: Multiplier Mayhem Review today! If you like Drive: Multiplier Mayhem, you'll love these slot titles too!